You might remember my Australian pal Licia Politis who I met in a Yahoo paper group years ago - we've become fast friends and stay in pretty close touch. Maybe someday we'll actually meet in real life - I hope so! 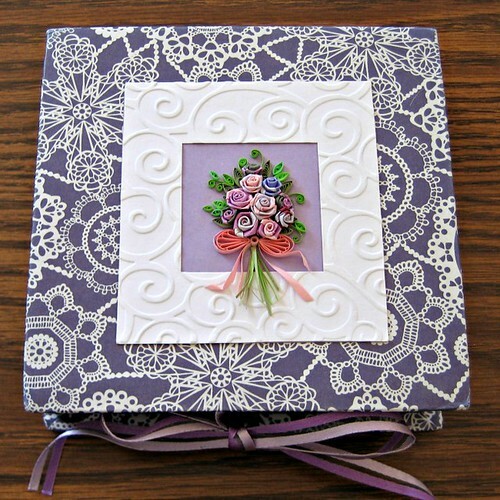 Licia never fails to amaze me by creating at least one ambitious quilling project each year. Usually it's something she magically completes at the very last minute before the annual Sydney Royal Easter Show competition - and then winds up winning awards! 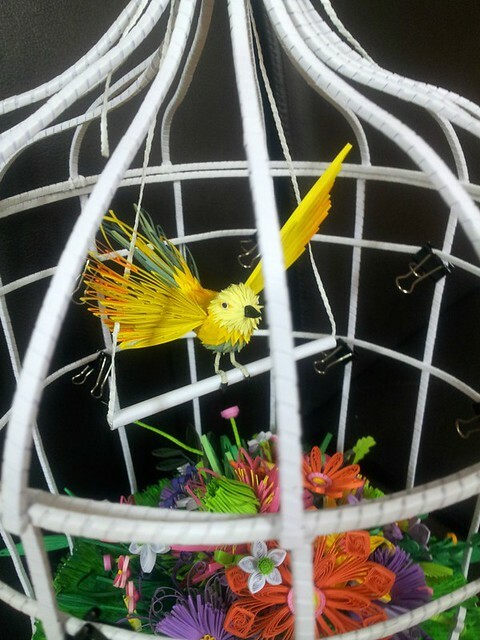 The next thing I knew she was sending over photos of this incredibly handsome bird cage which went on to win more awards at the British Quilling Guild's convention for technical ability and intricacy. The sturdy white struts are called bandaged bundles. 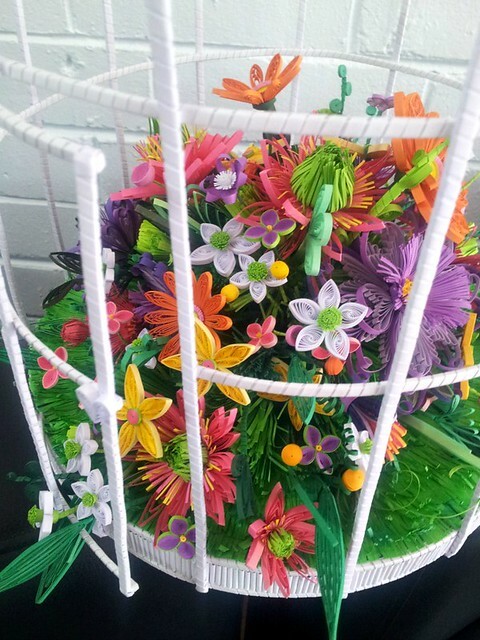 Each is made of fifteen stacked and wrapped quilling strips. Struts can be gently shaped before the glue completely hardens to create curves... trial and error teaches you when to do the shaping so the strips don't buckle. The cage has a door that opens and closes, and a chain of interlocking ring coils at the top. I love the way the bird is perched on the trapeze as if he's about to fly off to explore the fairgrounds. This past year has been an especially busy one for Licia as one of her daughters launched an online and retail party supply store in New South Wales called House of Party. In addition to Licia's full-time job as a barber, she helps out in the shop by fringing colored tissue to make bespoke tassels that are very popular for weddings and parties. 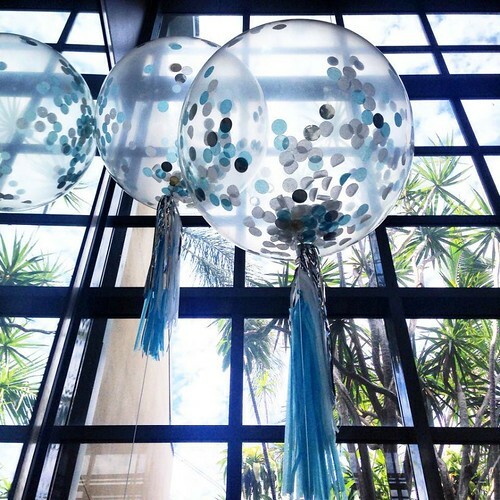 Five or more tassels hang as tails on big helium balloons. Inserted color-coordinated tissue paper confetti makes them look even more festive. Recently Licia made colorful 1st birthday party invitations by machine stitching around the edges of vellum sheets on which the party details were printed, to hold loose confetti dots between the layers - really cute. 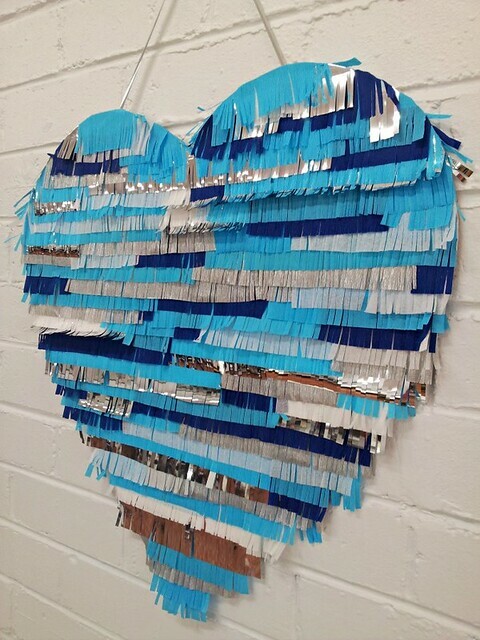 Another simple but eye-catching party decoration she made is this fringed heart that's about 20 inches (50 cm) high and wide. You can use tissue or crepe paper for the layers. 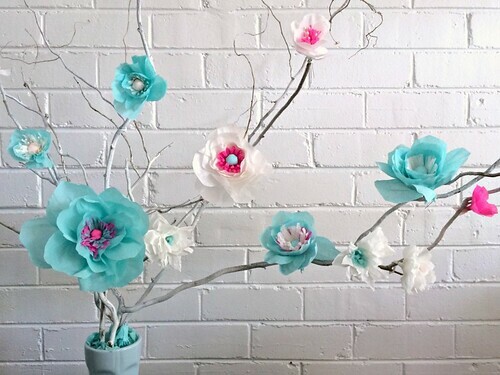 As part of her Christmas decorations this year - remember, it's summertime Down Under, thus the pastels - Licia painted branches white and attached crepe and tissue paper flowers she was inspired to make after checking out Paper to Petal from the library. Licia surprised me with this beautiful box of handmade presents. She used different colored strips for the two-tone folded roses - I'll have to try that. 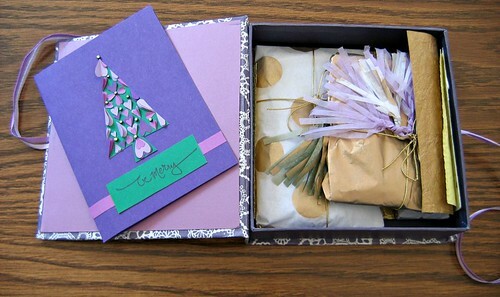 Inside was a cute tree card composed of folded hearts and gifts wrapped in gold tissue - with tassels, of course. :) Also several sheets of specialty metallic papers to play with. The packages contained a light blue and silver necklace and bracelet set I look forward to wearing this spring (which can't come soon enough if you ask me - brrrrrr)! 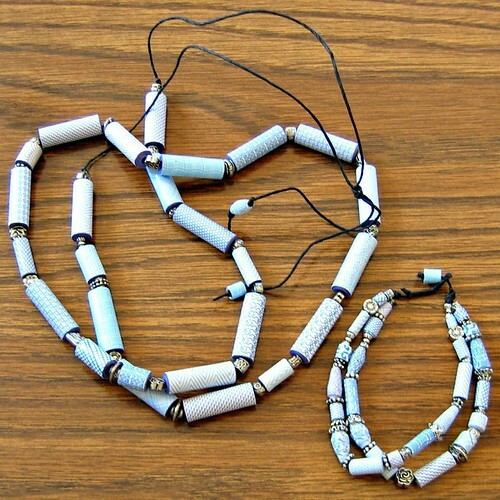 The paper beads are made of rolled strips cut from security envelopes. The cross-hatch patterns are so delicate - much nicer than the ones that arrive in the mail at my house. Licia threaded the beads on sturdy black paper yarn from PaperPhine. Believe it or not, when I snapped this photo I didn't try to arrange the necklace in a special shape - it just naturally positioned itself when I put it down. How perfectly fitting... Licia, I heart you! Follow her on Instagram, paper_to_jewellery, and also House of Party for lots of paper goodness. How beautiful! 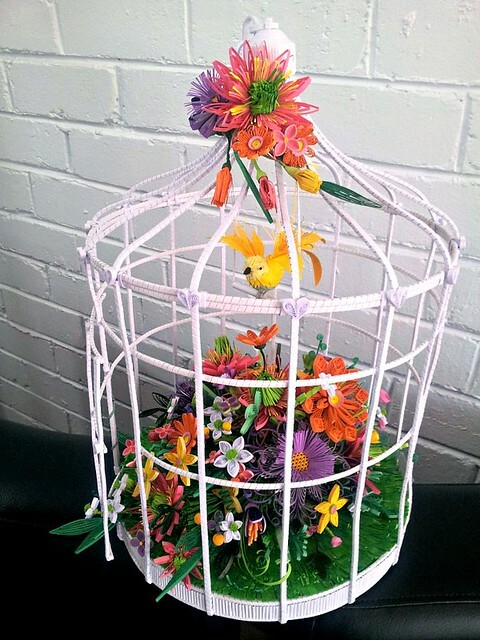 That bird cage is especially stunning! I hope you get to visit Australia one day. Thanks Lisa, so do I! Just wish it wasn't such a crazy-long flight. Amazing Licia!! How perfectly quilled 3D bird, no surprise it won! I must try the toned roses too. The fringed heart too is such an excellent idea. Lovely post Ann! 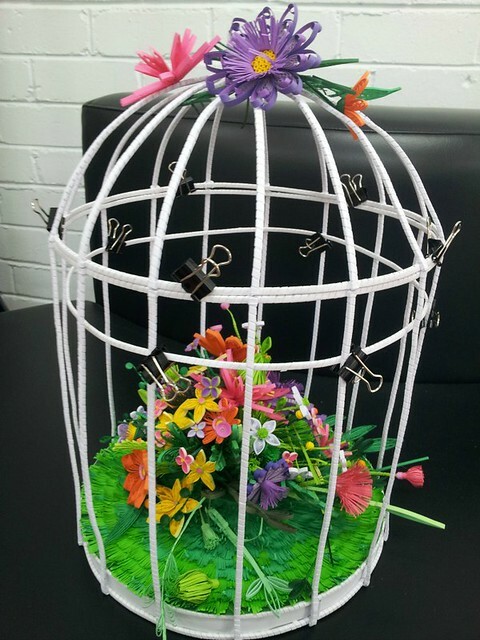 Stunning projects....especially like the bird cage!!!!! Many thanks Ann for the feature showcasing my paperart. thanks to all who commented on the feature! I just adore paper as a medium!